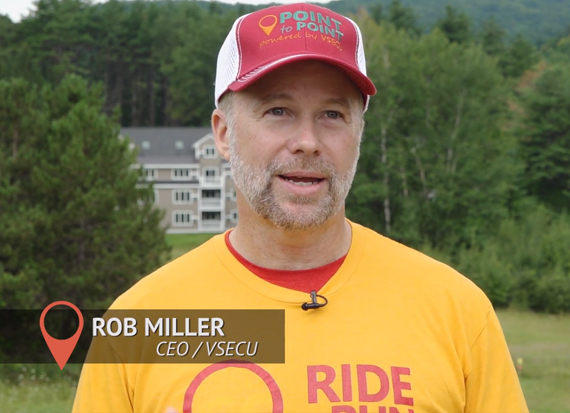 The Point to Point, powered by VSECU, is a cycling and running event that was created in 2002 to raise funds and awareness for the Vermont Foodbank’s mission to end the growing problem of hunger in Vermont. Help a neighbor in need and have fun doing it! 18th Annual Point to Point - August 10, 2019. Get ready for a beautiful ride on Vermont's scenic roads. Choose from three road ride distances: 100, 50, and 25 miles. Do you like the challenge of the trail? Our 20-mile mountain bike ride tests your skills and strength on beautiful Ascutney Trails. Prefer to go wheel-less? Register for the half marathon trail run, where you can explore the winding network of the Ascutney Trails. 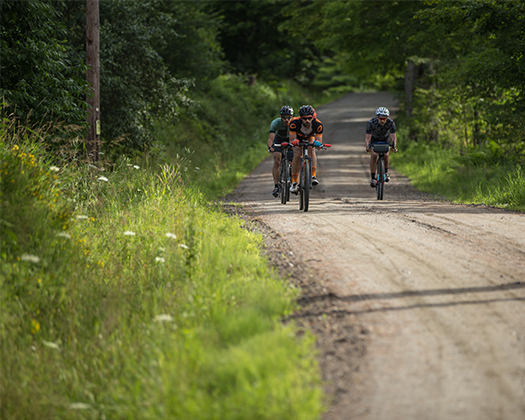 New this year, the 28-mile gravel grinder offers fresh terrain, and an 18-mile alternate route for those who want to take it easy. While you're waiting for your friend(s) to finish, enjoy the festival, with fun family events, post-ride food trucks, and much more. Volunteering is one of the best gigs on event day. Register now to support riders and runners by lending a helping hand. Every dollar that is donated through the Point to Point goes directly to the Vermont Foodbank. Our goal is to raise $150,000! It's a lofty goal that we hope to exceed with your help! What’s it like to participate in the Point to Point, powered by VSECU? Watch this video to find out. You’ll see the athletes in action against the backdrop of Vermont roads and trails and will feel the energy of the P2P Festival. If you use your imagination, you may even be able to catch the aroma of the grill and feel the cool bite of Harpoon beer on your tongue. Check it out and don’t forget to register soon so you can get a jump on fundraising for 2019. If you have registered for the event, you will receive a monthly eNewsletter containing updates, so make sure your inbox is set up to accept our emails. We will also highlight important updates here, so you'll know where to find them. Raise $200 or more and we'll enter your name in the hat to win a new road or mountain bike. Our helpful FAQ sheet should answer most of your questions about event day. Not sure where to stay or what to do while you're in town? We've got some suggestions. Download the schedule of events to find out what to expect and when to expect it. REFUND POLICY: We are unable to issue refunds. All funds will be donated to the Vermont Foodbank.